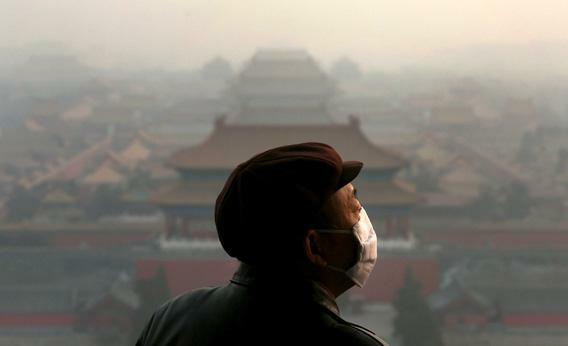 China’s smog crisis poses a threat to the legitimacy of the Chinese Communist Party. Is China’s Communist Party Choking? The country’s growing smog crisis is a threat to the regime’s right to rule. The U.S. Embassy in Beijing has been monitoring local air quality using a scale that officially stops at 500, with readings anywhere from 301 or above considered “hazardous.” Last Saturday one unofficial embassy reading hit 800. Photograph by Feng Li/Getty Images. The fact that I grew up in Los Angeles has rarely felt relevant for my work as a China specialist. But it sure did last weekend as record-breaking levels of smog descended on Beijing. The smoggiest days I remember from my childhood in L.A. were no match for the ones China’s capital has experienced lately. In the past week, smog levels there exceeded anything seen in recent years—and Beijing is no stranger to lung-choking air. The U.S. Embassy in Beijing has been monitoring local air quality using a scale that officially stops at 500, with readings anywhere from 301 or above considered “hazardous.” But last Saturday the numbers soared well beyond that, with one unofficial embassy reading hitting 800. Bloomberg reported that the head of cardiology at a Beijing hospital said that the number of people coming into emergency rooms with heart attacks doubled last Friday. Still, growing up in L.A. left me with an appreciation that heavy smog can do more than just make it hard to breathe or obscure the view. In the 1960s and 1970s, it affected Los Angeles’ real estate market: Houses close to the coast cost more, not only because of beach access, but also because breezes coming off the ocean kept the air cleaner. Beijing’s horrific smog has much more important unintended consequences. In seeking to legitimate its rule, the Communist Party insists that under its watch, especially in recent economic boom times, life in Chinese cities has gotten steadily better in every way. This development-equals-progress narrative has been losing purchase thanks not just to worries about air pollution, but also tainted food scandals, the most famous of which involved milk powder laced with melamine, and a concern about chemical plants spewing toxic run-off into waterways, which has inspired an uptick in not-in-my-backyard protests across China. The declining power of this particular legitimating story matters a great deal, since skepticism has grown about other tales dear to the party. Since the Mao era, for example, the Communist Party has based its legitimacy in part on the idea that its leaders are far less corrupt and much more committed to equalizing wealth than their Nationalist Party predecessors. These ideas have become laughable to many after a string of corruption and nepotism scandals and a sharp increase in the inequality separating the lifestyles of the wealthiest and poorest segments of China’s populace. One thing that the party has done to try to make up for this legitimacy deficit is ratchet up references to past humiliations by foreign powers and its appeals to nationalism. China spent a humiliating century being bullied by other countries, party spokesmen remind the public, but when the Communists took power the tide turned and China started on the road back to global prominence. The party’s other response has been to emphasize that many Chinese, especially those living in cities, now enjoy a level of comfort that outstrips anything that their parents and grandparents enjoyed—indeed could dream of. Life is getting better, the party claims, and those who have not yet benefited need only wait their turn. But public-health scares and heavy smog in Beijing and others places—believe it or not, at times other cities have even darker skies than the capital—are leaving some people skeptical about whether things are really getting better simply because they can now buy things at a mall. Is life really improving, they ask each other in private conversations, in online forums, and at protest rallies, if doing ordinary things like drinking milk and playing outside can cause your child to get sick? How can we trust a government, they wonder, that tries to hide the truth about obvious dangers, by censoring reports of doctored food and drink and until very recently used the word fog to describe the noxious substance that made it hard to see even nearby skyscrapers? In most places, a smog crisis is an environmental danger and, on some days, a public health emergency. In China, the grey skies overhead strike at the very legitimacy of the country’s ruling party. At its worst, Los Angeles never had anything that could compare to that.